For support and more information, call us today! Join Our Team of Caregivers Today! We need Direct Care Service Workers, Certified Nursing Assistants, and In-Home Care Companions! You can have a rewarding career caring for people within your commmunity. You may be helping a senior who needs a little companionship for a community activity, or a disabled adult or child who needs help with dressing, grooming or preparing light meals. We also provide services to people recovering from an injury or surgery and only need temporary assistance. Are you interested in a rewarding career? A career at Gulf Coast provides you with the opportunity to join an outstanding staff of professionals who are supported by company leadership and resources. You can have the benefit of flexible hours, competitive pay, a health and dental benefits package, on-going training programs, supportive leadership, and unlimited opportunity for career advancement and success. A job where you KNOW, at the end of the day…you've made a difference. If your answer is yes, we want to speak with you about the opportunities we have at Gulf Coast Social Services. For over 35 years, we have been providing caring service to the families of Louisiana. Located in seven regions, we have a professional staff of approximately 750 employees who assist and care for families. 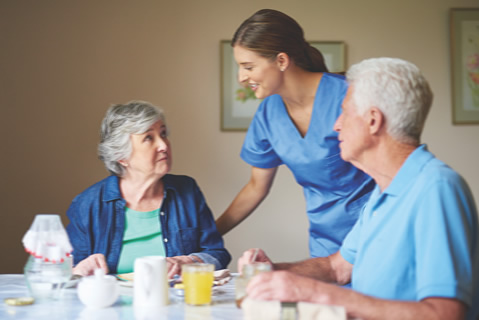 In-home care is one of the fastest-growing careers today, with rising healthcare costs, busy families and a growing senior market, the need for in-home care workers continually grows. Assist clients with personal care such as hygiene, bathing, grooming, dressing, etc. If you have a caring personality and enjoy helping seniors, special-needs children or someone who has had a medical procedure and requires in-home assistance, call us today. Gulf Coast provides opportunities that can lead you to a rewarding future. Our exceptional caregivers love what they do, and it shows!